The Slovak Legion is a multi purpose facility suitable for any occasion. We are in the convenient south core, our property has ample parking for your guests and we are 100% Wheelchair Accessible. We are a friendly, professional and experienced staff who can meet or exceed all of your expectations. WE ARE NOW ACCEPTING SHAG BOOKINGS. During the year 1936, Veterans of the First Great War of Slovak descent who served with the Allies banded together and decided to form a branch of their own with the Canadian Legion B.E.S.L. On July 9, 1936, Comrades Thomas Suffak and Andrew Medvecky procured membership forms from the executive of the Canadian Legion Memorial Hall on May Street through their President Williams On December 14, 1936 Mr. Alex Morgan presented the Charter to the Branch known as Canadian Slovak Veterans’ Legion Branch #129, B.E.S.L. 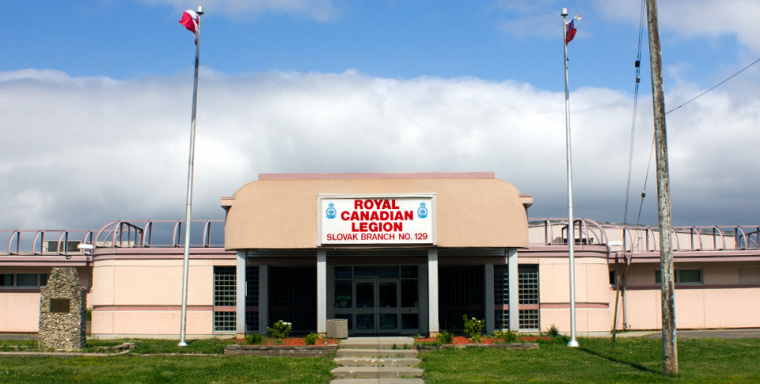 On October 21,1941 the first Legion Hall was purchased. The building was situated on Mcintosh Street and served the members well for the next 21 years. Property was acquired for a new hall on Atlantic Avenue and in 1962 the members moved in to a brand new facility which is still running smoothly. The Slovak Legion is well known throughout the community for its charitable and service work and will continue to be an integral member of the city of Thunder Bay. We currently have a Branch membership of over 315 members with an active Ladies Auxiliary as well. March 18th, 2015 – Dear Slovak Legion Chef and Staff – “I attended the Red Cross Luncheon yesterday and enjoyed the meal so much. Your Irish Stew was sublime – tender meat and elegant seasoning. Thank you so much for “making the day” with your food.” Sincerely Elizabeth Joan Black.